150mm x 150mm opening card invitation. A5 INVITATION - an A5 invitation. A5 INVITATION PACK - this lovely bundle consists of an invitation, RSVP (printed on the reverse with your address) and an information card, tied together with a coordinating ribbon. A5 FOLDER WITH INSERTS - this neat folder holds all the information for your guests in one stunning package. Included is an invitation, RSVP and information card. POCKETFOLD INVITATION - a coloured or plain pocketfold containing an invitation and RSVP card and details card sitting in the pocket. A personalised bellyband secures the folder together. R.S.V.P. CARDS are 150mm x 150mm or A5 in size and printed on the reverse with your address. DETAILS CARDS are 150mm x 150mm or A5 in size. SAVE THE DATE CARDS are A6 in size and are printed on one side. ORDER OF SERVICE are A5 folded booklets, containing 8 pages of text inside the cover. ORDER OF THE DAY are 4 page A5 folded booklets. MENUS are A6 booklets with the menu printed inside. PLACE CARDS are tent cards finished with your chosen design and supplied printed with names and creased, ready to be placed on your tables. PLACE CARD TAGS are 100mmx50mm and hole punched and supplied with 1 metre of twine or ribbon. TABLE NAMES are A5 cards printed on one side. THANK YOU CARDS are folded to A6 and printed on one side. TABLE PLANS are A2 in size and come mounted on foam board or unmounted. The image below shows examples of the fonts we offer. 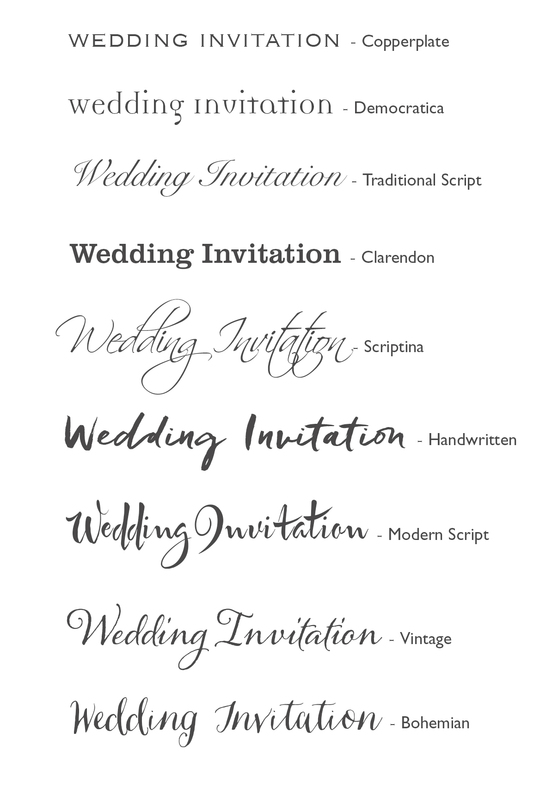 Choose your font and we will set your stationery so it has the exact look you require. The font you have chosen will be for the names and/or headings, we will use complementing fonts for the rest of the text.